As far as is possible, all sessions should be interdisciplinary including the relevant medical, nursing, paramedical and technician staff that form part of the clinical team. Ideally participant groups would be composed of actual clinical teams who work together during episodes of airway management. Where relevant this can include clinicians across different specialities including anaesthesia, intensive care, emergency medicine, surgery and prehospital care. Note that Inspire in isolation will not provide competence in emergency airway management and should only be run in combination with existing accredited airway training programs. Module 1 is an entirely self directed, on-line module which individual clinicians can perform themselves prior to attending interactive face-to-face sessions. The intention is for module 1 to provide a foundation of knowledge that minimises the need to consume the potentially limited time available for team training, presenting didactic material. There are no specific educator resources for module 1 but local coordinators of the Inspire program should encourage learners to complete module 1 prior to attending the interactive sessions of the subsequent modules. An opportunity to facilitate an interactive, team-based discussion of any issues raised by the material covered in module 1 is incorporated into the lesson plan for module 2. In cases where there is considerable confusion it may be necessary to allocate an additional dedicated interactive session to exploring this further. All instructors in subsequent modules should have completed the material in module 1 themselves. This is the first module of the Inspire program to include a face-to-face interactive session. It consists of a single, one hour faciliated debrief of 'The Elaine Bromiley Case' and 'What If' videos and includes an opportunity to explore participants thoughts on the material presented in module 1. This can be run as a stand alone session or in combination with other Inspire components as part of a half or full day teaching program. Lesson Plan - this includes links to other preparatory materials for educators running this session. Learners should watch this at home prior to attending module 3 sessions. It may be useful to get learners to watch the video again together during face-to-face sessions prior to participating in the Transition workshop to model use of the language and team interactions. This can be followed by an interactive discussion addressing any queries by the group and incorporating some of the relevant discussion in the 'Foundation' section of the lesson plan for the Transition workshop. The Vortex Approach does not advocate a particular technique for CICO Rescue, either cannula or scalpel techniques can potentially be used if best efforts at all three lifelines are unsuccessful. Educators should develop their own lesson plan for a session that teaches CICO Rescue techniques that are consistent with local practice and clinical availability of equipment. More important than the specific technique for CICO Rescue used, is ensuring that the education session and technique(s) demonstrated conform to the principles of cognisance, competence, confidence, capability and context outlined by the Vortex Approach. For educators seeking details on teaching the technical aspects of CICO Rescue, videos including instruction in both cannula and scalpel techniques that are used widely throughout Australia, are available via resources provided by Dr Andrew Heard. The CICO Rescue Workshop is deliberately scheduled prior to the Transition Workshop so that learners will be familiar with the technical aspects of CICO Rescue and thus be able to practice the process of priming during the Transition Workshop. Many commercial CICO Rescue trainers are expensive and lack any head/chin structures. This results in learners practising this procedure in the absence of realistic anatomical impediments which they must then face for the first time clinically, during the stressful situation of a genuine CICO event. The Vortex CICO Rescue trainer consists of 2 components: a larynx component that inserts into a neck baseplate to provide realistic anatomical features. In the future we hope to larynx components with altered anatomy that can be substituted into the neck baseplate. Dr Andy Buck, developer of the Vortex CICO Rescue trainer. The larynx component is based on an original file open source file developed by University of Dundee, BodyParts 3D and The Database Center for Life Science. The Vortex CICO Rescue trainer is made available thanks to Dr Andy Buck who modified this original file as well as developing the neck component himself. Medical tape such as sleek can be used to replicate the cricothyroid membrane while 3-5mm foam can be threaded through the slots on either side of the neck component to act as skin. Addition of layers of thicker foam can be added to replicate subcutaneous fat layers and impalpable anatomy while ziplock bags of simulated blood can be added between the foam layers to enhance fidelity. 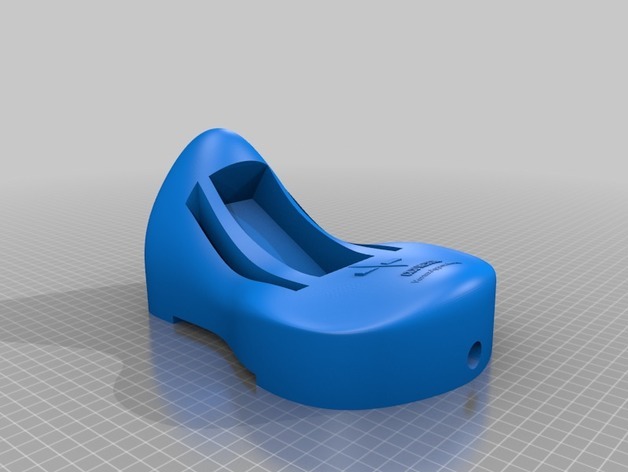 The files to 3D print the trainer can be accessed by clicking on the link opposite or the images above. Instructions on how to print and use the trainer are available at the download site. The following educator resources are available to help run this session. The Vortex training app has been developed to assist with training teams in effective use of the Vortex Approach as part of the above programs. It was created with the generous support of Tessa Davis, Minh LeCong and Peter Fritz and is available as a free download from the app store. This app is intended solely for educational purposes and should not be used during management of actual clinical emergencies where it may become a distraction. Note that the app is currently based on an earlier version of the Vortex Approach which employs slightly different terminology and an altered graphic. An updated version of the Vortex training app will be available soon. The Vortex training app is only available for use with iOS on iPad. Creator of the Vortex Approach. Author of all Vortex related materials. Principal consultant during development of the Vortex Approach. Co-author of selected Vortex materials (as indicated). © Copyright Nicholas Chrimes 2013, 2016. All materials on this site are distributed under the terms of the Creative Commons Attribution Non-Commercial No Derivatives License which permits use without alteration for non-commercial clinical or educational purposes with proper citation of the author & copyright holder of the original work. No derivative works. For commercial use please contact the author. Any reference to, depiction of, links to or demonstration of specific products, manufacturers, distributors or trade names on this website is for illustrative purposes only. No remuneration, financial or otherwise, was received by the author in return for highlighting any prorprietary brands. Neither the Vortex Approach nor its author have any affiliation with industry members. The Vortex Approach does not specifically advocate or endorse the use of any particular product.